NNC’s Pediatric Chiropractor, Dr. Nelson creates treatment plans to fit a child’s size, weight, and unique spinal condition. Her adjustments are both gentle and specific to the child’s developing spinal structures. 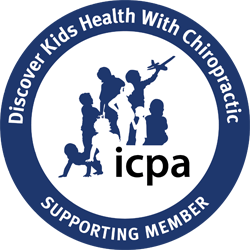 Dr. Nelson is certified through the International Chiropractic Pediatric Association and works to ensure proper spinal development and alignment of Northern Nevada Chiropractic youngest patients. From birth through puberty the human body goes through massive growth and changes – more than any other time in life. A healthy spine in a child is not something that should be taken for granted, or ignored. Chiropractic for kids helps ensure proper alignment through all those critical growth milestones. It can also help with common childhood issues like bed wetting. When a baby is born significant spinal trauma can occur. There is so much pressure on that tiny body as it comes into the world. For this reason, many parents have their newborns checked right away. As babies grow and start learning to hold their heads, sit, crawl and then walk, they are using their spine. Spinal alignment in babies is critical to ensure proper growth and to prevent any injuries as the child ages and becomes more adventurous. Pediatric chiropractic becomes even more essential as a child ages. They start to do normal childhood activities like riding a bike, skating, sports, etc. and these can result in small but significant spinal misalignments. If these spinal misalignments are neglected in childhood where we see the most rapid period of growth in a person’s life, they can lead to more serious problems later in life. Subtle trauma throughout childhood will affect the future development of the spine leading to impaired nervous system function. Any interference to the vital nerve system will adversely affect the body’s ability to function at its best. In this video, Dr. Nelson talks with KOLO Mom’s Everyday about how chiropractic care can help babies and their development. Regardless of the birthing experience, it can be traumatic for baby. Chiropractic care for babies is less about pain management and more about the health of the nervous system and proper function of the muscular skeletal system. Once these are in-line, it allows for optimal development. Hear from some of the patients of Northern Nevada Chiropractic.